I know we've been all healthy and stuff lately, but I'm about to go a different direction. The exact opposite direction in fact. 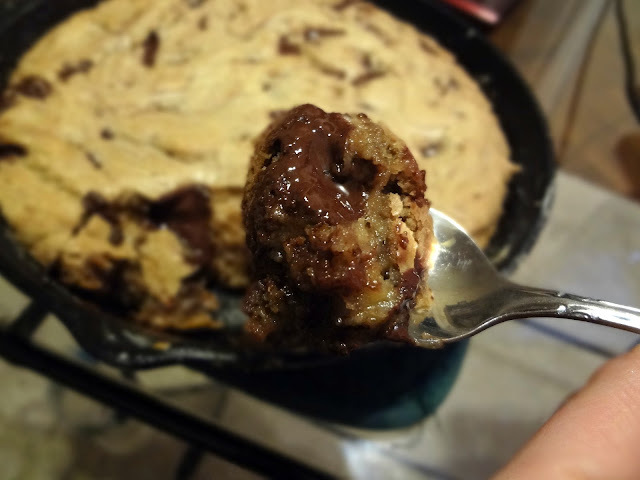 A giant, thick, gooey cookie. One skillet-not piles of bowls, etc. to wash.
Oh yes, this sounded like a good idea to me! When Michael got me an 8 in. cast iron skillet for Christmas (which he totally felt like an awful boyfriend for giving me, but I, freak that I am, was so ecstatic you have no idea. The only present that prob. would've made me happier was a particular ring ;) ), I knew the first thing I had to make with it was this cookie! I'd been lusting after it for quite some time. My excitement was palpable. The skillet cookies is awesome. VERY gooey, super easy clean-up, and ridiculously decadent. However...I don't know. Not my favorite. I liked it, just not as much as, say, a chocolate chip cookie pie, or even a normal cookie. It lacked...depth. The goo-factor sort of just took over, and the cookie itself was almost bland. It was good, but I have a million other desserts I'd prefer to waste my calories on :P. That said--I think this is a PERFECT thing to make if you ever host a slumber party (I totally miss those, btw.) or if you know a teenage girl who's down in the dumps. There's something oddly satisfying about digging into a huge cookie in a skillet with spoons. It's super fun and feels naughty :P. You guys should totes try it--perhaps I'm just crazy and you'll like it better! 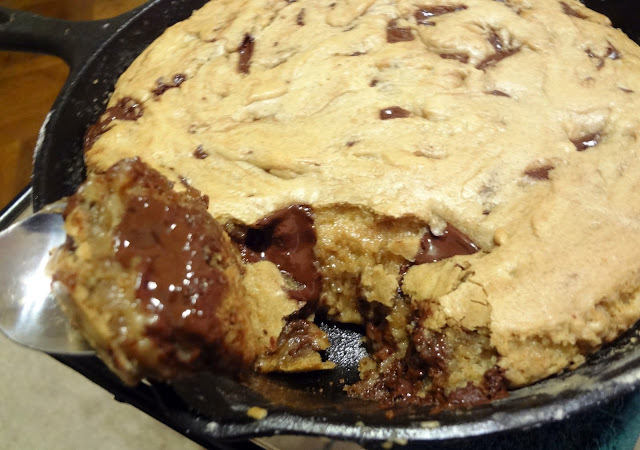 From Sophistimom's "one-pan dark chocolate chunk skillet cookie"
In an 8 inch cast iron skillet, over medium-low heat, melt the butter. 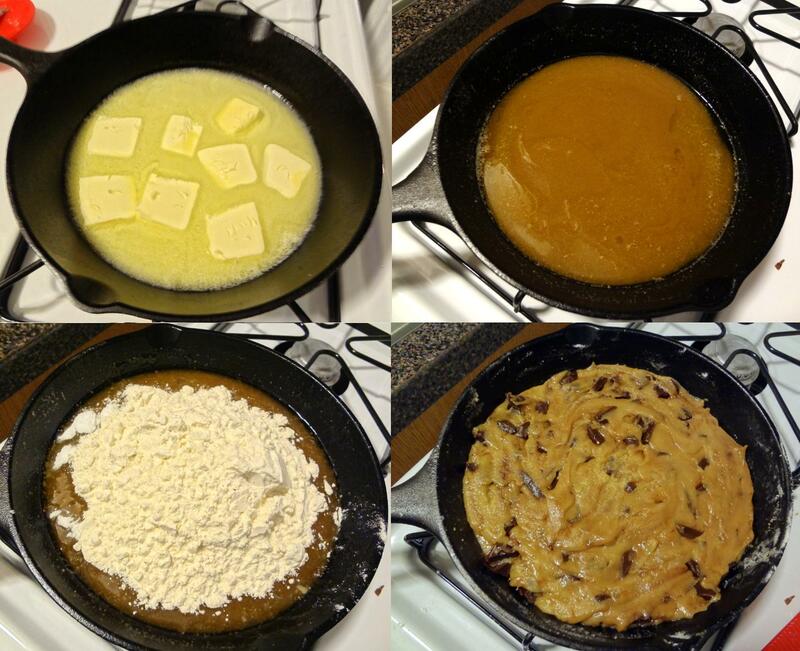 Stir in sugars and vanilla extract and remove the skillet from the heat. Let rest until the skillet is warm-no longer hot-about 5 minutes. Crack an egg into slightly cooled mixture. Using a fork, whisk it in. Measure flour, baking soda, and salt on top of the wet ingredients in the skillet, and carefully stir it in, until smooth. Bake in oven for 15-20 minutes (cooking time may vary) until golden brown around the edges and on top, but soft in the middle. Dig into the gooeyness. Serve with ice cream, if you like. I am so in looove with skillet cookies. After I made a breakfast one a while back I have been obsessing over all the different ways they can be made, and I actually have a new one coming up soon! All I need is a fork and I'll be ready to dig into this! It looks amazing, K! It looks real purty, even if you didn't totally care for it! This looks amazing! I have two mini skillets...maybe I could cut the recipe in half to make mini cookie skillets! Do you think that could work? Anyhow, that forkful does make me hungry and indulging in this chocolatey goodness can make for a better day. Simply delicious! 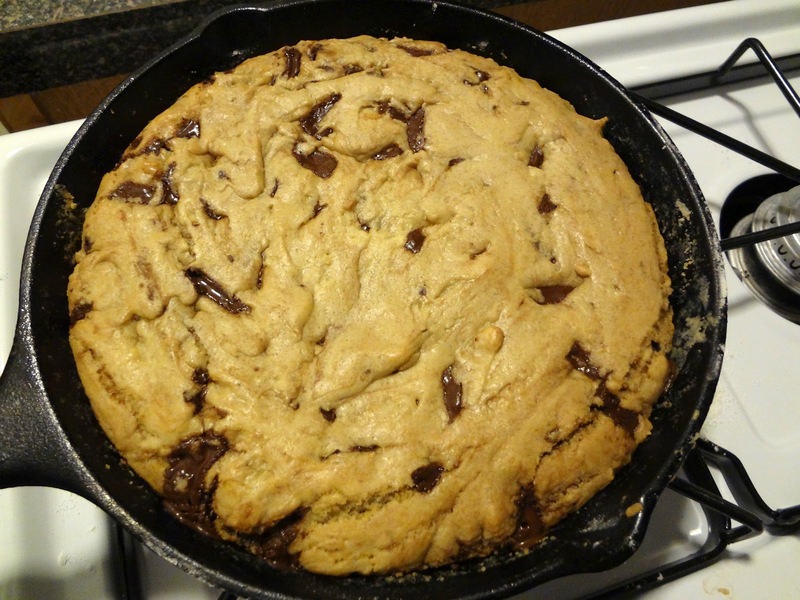 Girl, that skillet cookie looks delicious. I just want to dig my spoon right on in and savor the deliciousness. Thanks for sharing. LOVE this! so gooey and chocolately - looks amazing! I love this, the whole skillet idea is fantastic! Definitely like the idea of taking a spoon to it! The gooey factor is what makes me want it all the more. I am sure to end up with a stomachache afterwards though. That is gooey and amazing! Love it! i would JUMP FOR JOY if someone gave me an iron cast skillet for christmas!! !